This statistic presents the weekly usage of mobile data and communication services on mobile phones in selected countries as of 2016. During the survey period it was found that 40 percent of mobile users in the United States accessed instant messaging services on their phone phones at least on a weekly basis. UK=3712, GER=1838, JPN=1431, AUS=1864, ITA=1862, SWE=1906, FRA=1847, USA=1774 Q.34 Please state which, if any, you have used (at least once a week)? 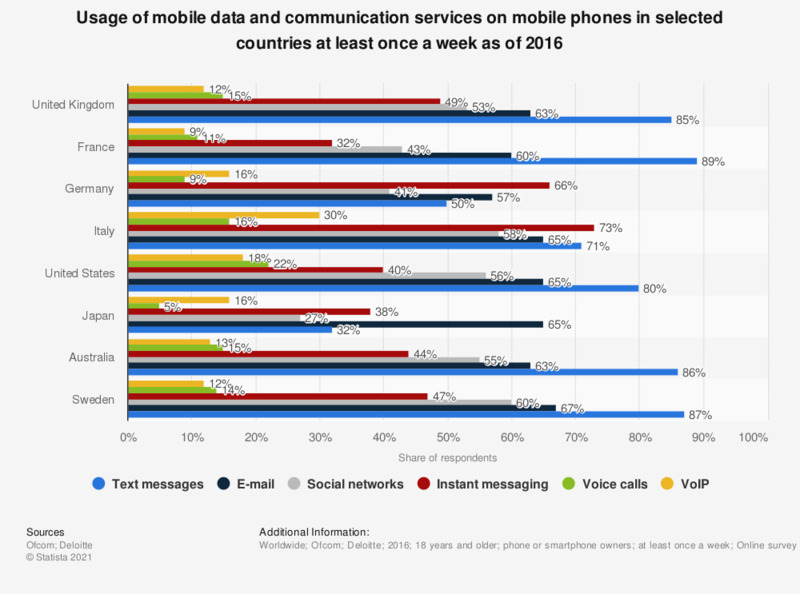 Note: Text messaging is not relevant for Japan, as respondents may have confused text messaging with similar services that are available.